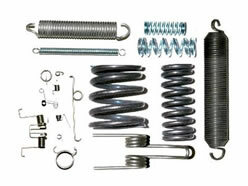 Whether you’re making flatform springs, compression springs, extension springs, torsion springs or wireform springs; your challenges are very unique. Spring manufacturing has evolved over the years and with it, the challenges have multiplied ten fold. You probably handle many different types of orders, from the prototype to blanket orders with tens of thousands of parts. E2 job shop software can help you with the demand of customers constantly changing quantities and due dates. E2 can help integrate your purchasing needs with your jobs so you are not sitting on money in your inventory. You need the visibility and flexibility of updating your purchasing requirements in real time with your job schedule. E2 is also very strong in lot traceability so you can associate materials with specific jobs. E2 also gives you the ability to attach material certs to the jobs and print out automatically when you are shipping the finished parts to your customer.